Ed Garrick of Port Charlotte graduated from high school in time to got into the last few months of the Korean War. After boot camp he arrived off the coast of Inchon, North Korea and was taken ashore in landing craft in the middle of a snow storm. “It was before the armistice was signed. We took a train with no windows. Chicken wire covered where the windows would have been. Armed MPs were at either end of the passenger car. We had our rifles, but we had no ammunition,” he recalled more than 60-years later. “We got off the train and they sent us to our outfits. A close buddy, Tom Perkins, and I ended up together in Love Company, 31st Battalion, 7th Division,” Garrick said. “Finally we got to Pork Chop Hill. The Hill was an inconsequential mound of dirt along the 38th Parallel dividing the two Koreas. It was fought over during the spring and summer of 1953 by hundreds of American and North Korean troops while the armistice talks were in progress at P’anmunjom. During the initial assault the U.S. and its United Nations allies captured Pork Chop Hill. Immediately afterwards the North Koreans and Chinese staged a much larger assault on the hill that killed hundreds of Americans and thousands of enemy soldiers. 547 Americans lost their lives and 1,036 were wounded taking and losing the hill. The enemy lost approximately 1,500 killed and another 4,000 wounded. They did and Garrick and Perkins went up the hill together. That was their introduction the Pork Chop Hill. “I was put in a .30-caliber machine-gun bunker. We were in the last bunker to the right. There was a series of bunkers all along Port Chop Hill,” he explained. “The hill was very steep and there was an eight-foot trench along the top. Tree roots stuck out in the trench and we tied cans to the roots so at night when somebody came down the trench you could hear them coming. If you stuck your head above the trench you were likely to get a sniper bullet between your eyes. “Myself and a young 2nd lieutenant were sent out in front of the front lines to a listening post,” Garrick said. “We were out there quite a while when all of a sudden we heard all this commotion. We called back to our lines and they shot up parachute flares that lit up everything. We could see hundreds of enemy soldiers below us getting ready to attack. I had never seen so many enemy soldiers in all my life. “We had a bunch of hand-grenades with us at our listening post. We waited until they got up one-third of the way up Pork Chop Hill then we started throwing grenades at them. We were throwing grenades just as fast as we could pull the pins. “About the time we ran out of grenades we realized we were caught in the middle. The Chinese were advancing on our position and if we retreated toward our lines we would be caught in the middle of incoming enemy artillery fire. “So the lieutenant is running down one side of Pork Chop Hill and I’m running down the other side. I looked over at the lieutenant who is running as artillery fire is coming down. All of a sudden he disappears. He was hit by an artillery round. “I got back to our line on one leg and one arm. I had been hit in the left elbow by a round and taken another round in my left leg and I was grazed by a bullet to my chest that didn’t go through. “I went back to our company headquarters because I couldn’t find anyone alive on our side,” Garrick said. “I don’t know whether I should say this, but when I walked in I found our company commander and company clerk slumped over their desks. They had been shot and not by the enemy. Somebody in our outfit didn’t care for the company commander and clerk so they put a bullet in them. I took a carbine because I couldn’t handle my M-1 because of my injuries and got the hell out of there. I started toward my bunker down the trench and met the Chinese who were coming up. I let go with my carbine and they let go with a hand-grenade that overshot me a bit. I was hit with shrapnel in my right leg and backside. While all this was going on, Tom, his buddy was trapped in a section of the trench with a bunch of dead Americans. He played dead and was bypassed by the enemy. He escaped back to U.N. lines and lived to talk about it. “Finally when we were told to pull off the hill there was only a handful of our company left,” Garrick said. 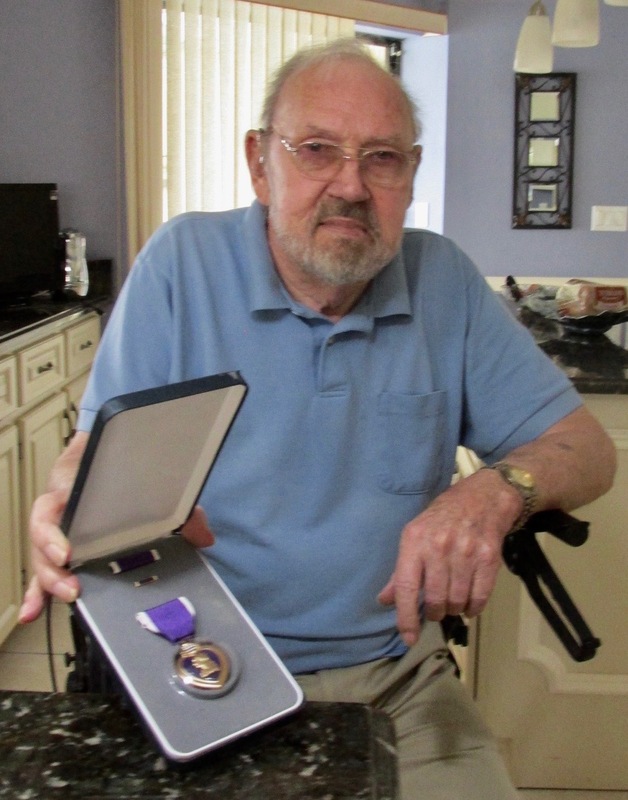 “I couldn’t walk by then, so all I could do is roll down the backside of Pork Chop Hill. When I reached the bottom I was tangled up in intercom wire that ran all over the hill. I untangled myself and was trying to figure out how I was going to get to a nearby access road that ran along the bottom of the hill. “I crawled to the road and was lying there with my parker on bleeding to death. I pulled the belts off several dead soldiers around me and tried to use them as tourniquets, but couldn’t tie them off because I only had one hand to work with. “So I’m lying there thinking about my plight. It’s only a matter of time before a Chinaman come along and sticks me with his bayonet or puts a bullet between my eyes. Then I get this bright idea, if I’m going, I’m going to take someone with me. So I took a grenade I had on me and pulled the pin and held the live grenade in my hand. “A short time later a Jeep come along the road where I was. It had a couple of Columbian soldiers in it who didn’t speak English. The Columbians were in a unit up on Pork Chop Hill near were we were. As soon as the first shot was fired they fled. They were moving bodies out of the road so their Jeep could pass without rolling over them. “When they got to me and saw I as still alive they threw me in the back of the Jeep grenade and all. So the three of us are racing down the road in the Jeep and it hits a bump in the road. When it does the grenade I’m holding comes out of my hand and lands in a drainage ditch filled with water and explodes. The last six months of his time in the Army was spent as company clerk for an Army unit in Japan. He was shipped home and discharged from the service in April of 1954. Garrick went back to work with General Electric where he worked before he went to war. That lasted about a year and his next job was a salesman for Life Savers candy. He started as a salesman and 18 years later he was in charge of sales for the Northeastern U.S. From there he went into the import business for another dozen or so years. He and his late wife, Martha, retired to Port Charlotte in 2011. They had two sons, Michael and Tom. This story was first published in the Charlotte Sun newspaper, Port Charlotte, Fla. on Monday, August 13, 2018 and is republished with permission. This story has some unusual elements- loose grenade, great quotes, photo w/ Mrs. Clark. Good job!